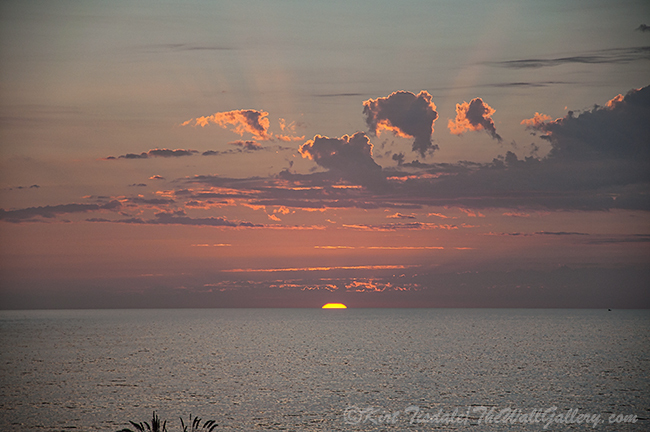 I love sunsets, especially those that light up the sky with vivid colors. The clouds and the sun have to be just right and when it is, it’s colorful magic in the sky. As you watch the hues build into brilliant shades of orange, pink and purple, you think it couldn’t get any better, but wait…it does! 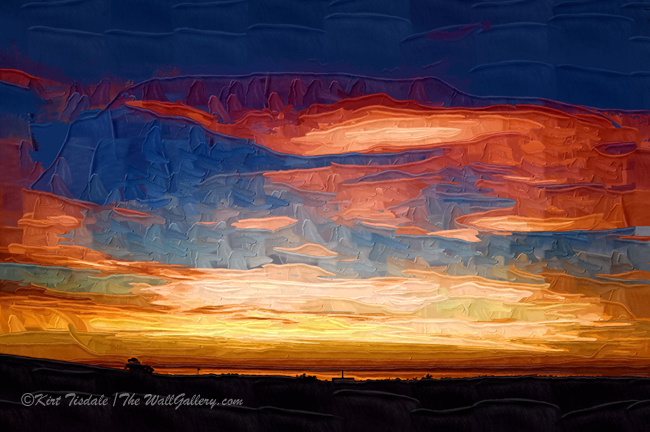 The art print I am featuring today celebrates just such a sunset. 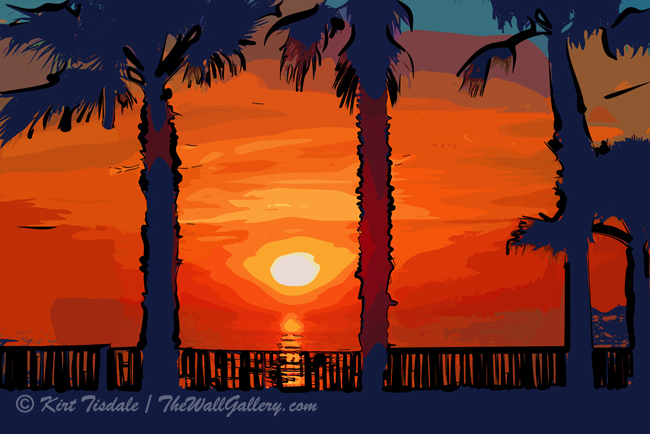 I chose “ Ocean Sunset Between Two Palm Trees” from my Tropical Collection. 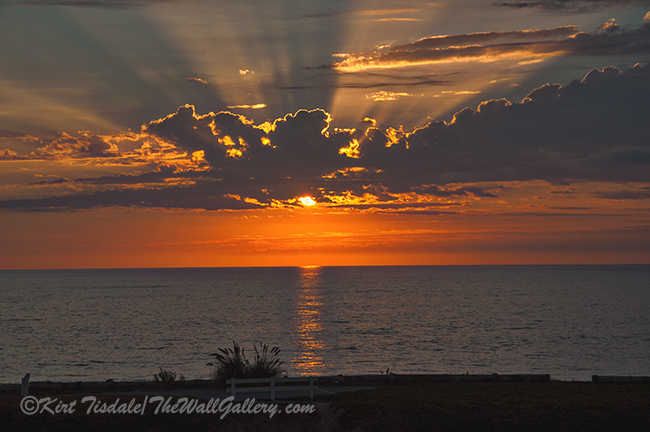 This particular art print is a sunset over the Pacific Ocean in Carlsbad, California. 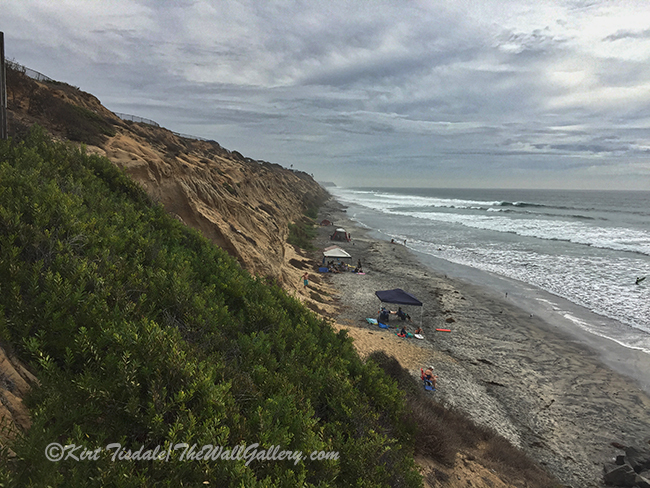 Located in northern San Diego County. 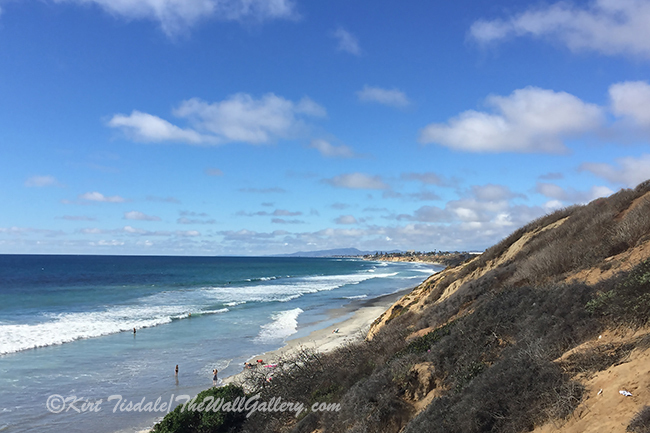 The city is known for its beaches and seaside flavor. 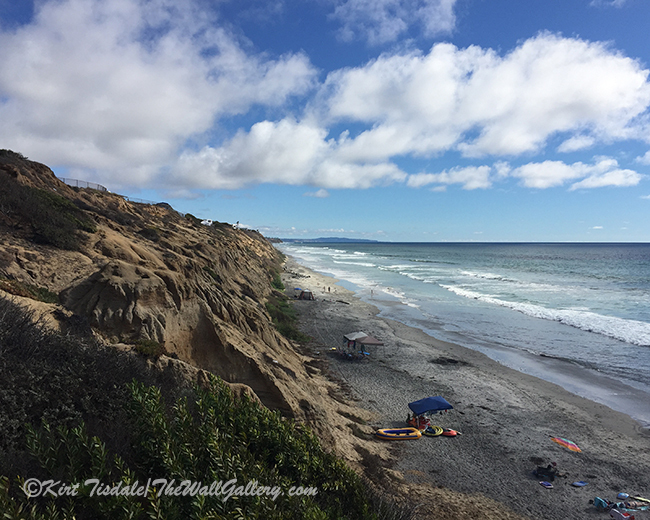 Along the Pacific Coast Highway is a walkway on a bluff above the beach in this part of town. 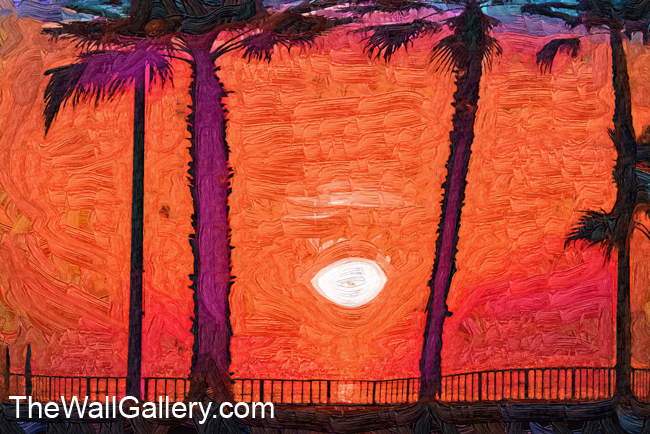 The print depicts a sunset along the walkway as the sun is setting between two palm trees. I used an abstract watercolor technique to pull out the vivid colors with the shapes as suggestions. Using an abstract approach creates different elements to a print. The abstract aspect is typically less dependent on detail and more on shapes and colors. 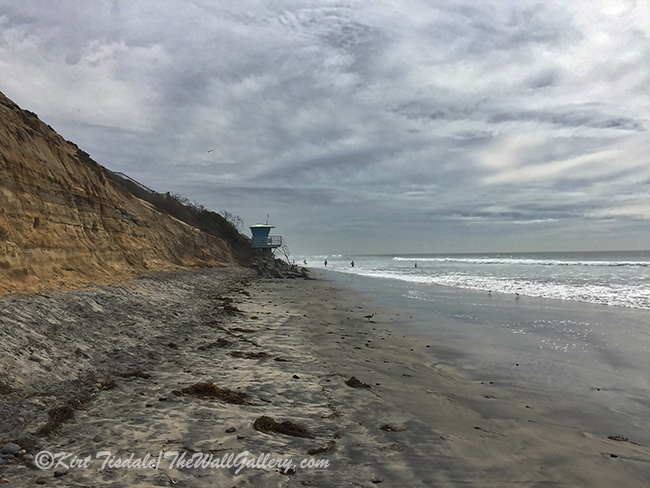 You can create an art print of the same scene in a traditional oil style and an abstract style and come up with two completely different looks. I have examples of that throughout my galleries. I can see a scene in a variety of ways and present it as such throughout the galleries. I recognize that abstract prints are not everyone’s “cup of tea”, for example; my wife likes more realism and I prefer abstract. To me, it’s “what does an art print say to you”. I create both types knowing that tastes vary. At the end of the day….just enjoy the sunset! Thoughts? I invite you to come into the gallery to view the collection in Tropical. 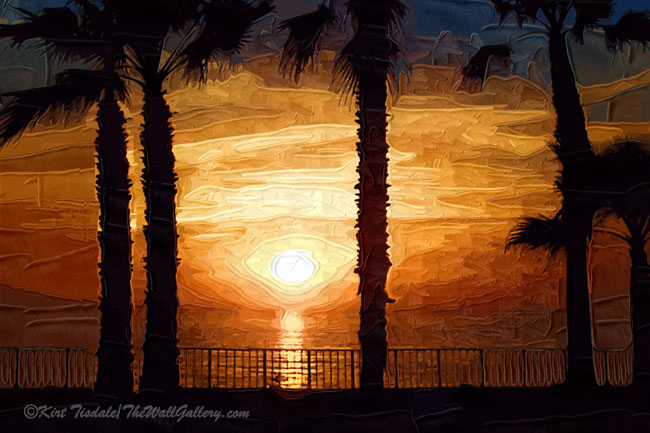 This entry was posted in Art Prints, Landscapes: Watercolor and tagged abstract art prints, artist kirt tisdale, california, carlsbad california, interior design, online art gallery, san diego, sunsets, tropical on September 12, 2014 by Kirt D Tisdale.